Guitar Lessons Llandudno. North Wales Kevin Cook Official Site. Yell.com is wrong. I'm a Classical Guitar teacher living in Llandudno, North Wales. My first love is classical guitar but I also play electric guitar and bass. I am available to play background music at small functions and events. 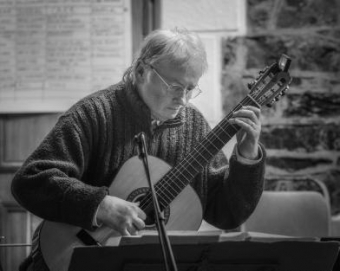 I am a founder member of Aberconwy Classical Guitar Club which meets in Penmaenmawr Library once a month. I teach people who are learning for pleasure. You need to commit to a schedule of practice and playing, but once you have mastered the basics, you have the chance to get involved with other musicians, either by joining an ensemble or playing solos to an audience. Playing classical guitar will equip you with a skill that will last a lifetime. Music to play at your level. Instant answers to questions and advice when it goes wrong. Technical exercises that don't hurt. Free EnsembleKev sheet music arrangements. Tune and re-string your guitar. Learn and apply music theory. Compose and record your own music and songs. Learn to review your recordings. You wouldn't buy a new hat or jacket without trying them on. The Guitar is the right instrument for you. I am the appropriate teacher for you. You have the available time to learn an instrument. The following link takes you to information about classical guitars, accessories and shops where to get gear.